Choose your favorite small cocktail glasses. 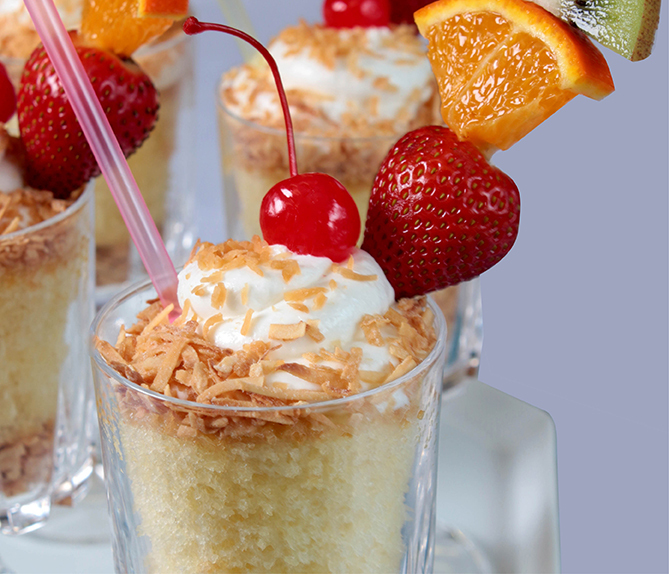 Sprinkle 1 tbsp (15 mL) coconut in the bottom of each glass. Place 1 cupcake on top. Sprinkle remaining coconut on top. Prepare 4 (8”/20 cm) skewers using the kiwi, orange and strawberries pushing the fruits to the top of the skewers. Insert into glass through cupcakes. Garnish with a cherry and insert a straw. Try other fruits for the skewers. Grapes and pineapple work well.